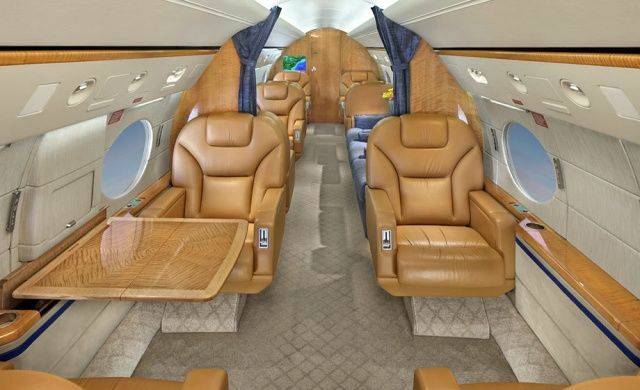 The interior of Steve Jobs's private Gulfstream jet is what inspired the hideousness of iCal's faux-leather skeuomorphism. Hate skeuomorphism? Hate the way Apple’s slathering all of its apps with faux dead cow skin? Tough luck, because you know whose idea it was? Steve Jobs himself. Can’t believe it? It’s apparently true. Fast Company spoke to former Apple designers who say that the sudden burst of skeuomorphic designs in OS X and iOS aren’t Scott Forstall’s doing, but Steve Jobs’s, who was so taken with the leather pattern on his private jet that he pushed the same pattern upon iCal. It’s worth noting, of course, that Steve Jobs has long embraced skeuomorphism. Remember when every surface of OS X was lacquered with fake brushed metal? In fact, the Mac operating system is one of the first major examples of skeuomorphic computer design: Mac OS was supposed to look like a virtual desktop. Of course Steve Jobs loved skeuomorphism. That doesn’t make the recent design blunders of apps like Calendar and Game Center any less embarrassing though.